Science and technology is constantly moving forward, but that doesn’t mean that some records will just continue to be broken. While planes with piston engines are still being developed, many roles nowadays are being fulfilled by jets. Therefore, it doesn’t really come as a surprise that the fastest propeller-driven airplane was actually born during the Second World War. However, we’re not really sure which one would it be. You may think that describing such record is simple – whichever one was the fastest is the record holder. But there are some layers to this question that we’d like to explore. But, first things first, the official record holder is Grumman F8F Bearcat – American single-engine carrier-based fighter aircraft. It took off for its maiden flight in August 1944 and was a mighty impressive aircraft. It was so potent, so quick and so versatile it managed to stay in service up until 1963, but even then it never stopped flying. AT this point enthusiasts wanted to get their hands on one and many did. Grumman F8F Bearcat became popular between acrobatic flying pilots and air racers. Of course, for these purposes plane had to be heavily modified. That was how the fastest of them all – the Rare Bear – was born. 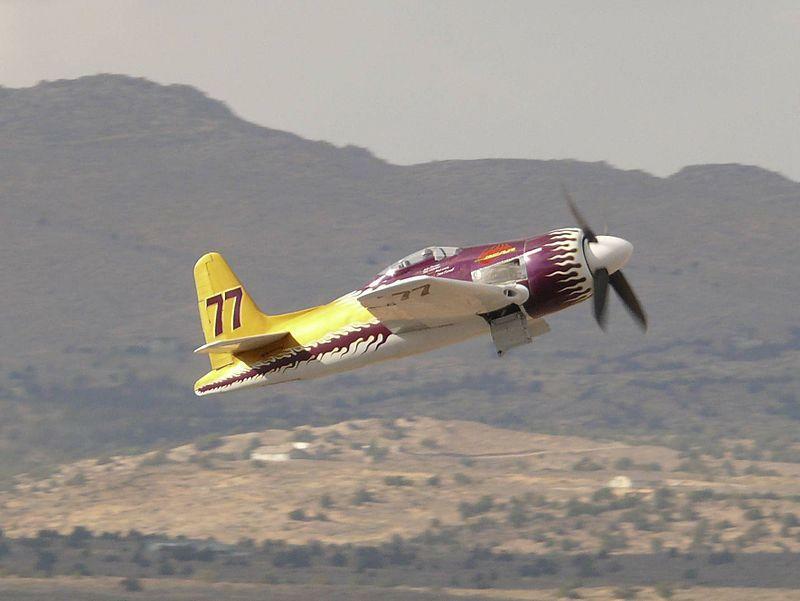 Rare Bear, extremely modified F8F Bearcat, dominated Reno Air Races for decades. It was just too fast for others to even think of competing with it. Its official record is 850.24 km/h and so it is the fastest airplane with piston engine in the world. Or is it? Rare Bear holds the official record, but another heavily modified airplane, based on British Hawker Sea Fury. 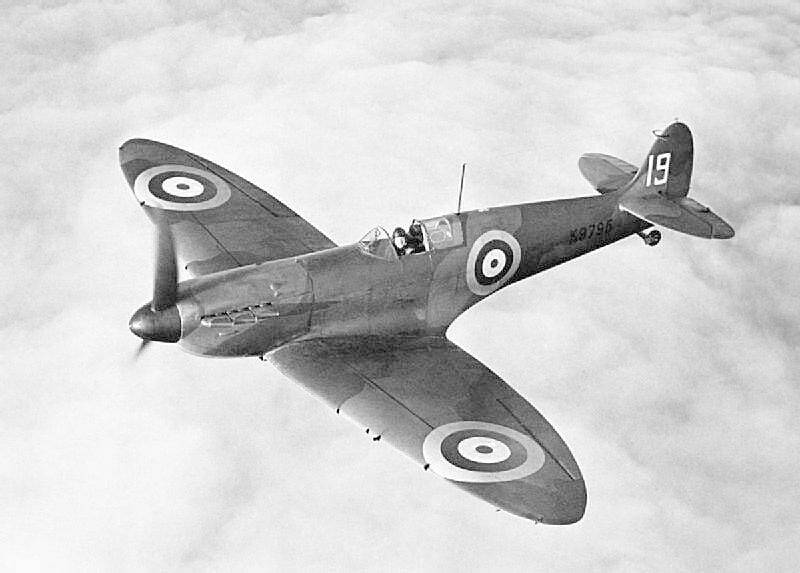 This fighter plane was also born at the end of the Second World War. Seeing that war is pretty much over, RAF lost interest in Hawker Fury, but the Royal Navy still wanted the fighter, so a Sea Fury version was developed. It was amazingly quick for its time, but, when got even quicker after it finished its service and got into hands of acrobatic pilots and air racers. 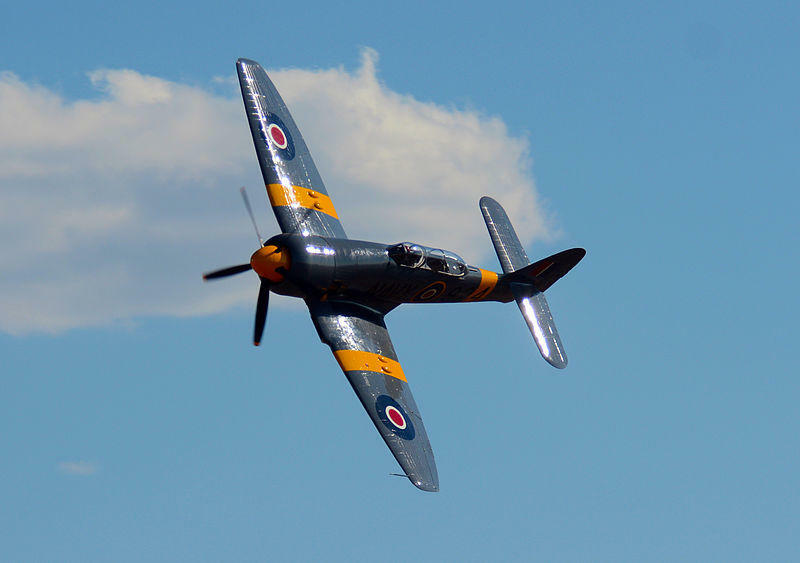 Unofficial record of highest speed of propeller-driven airplane belongs to a heavily modified Hawker Sea Fury – 880 km/h. So we know which airplane holds the record. But both of the contenders were heavily modified and it is kind of interesting to see, which airplane was the fastest straight from the factory. That would be German Dornier Do 335 Pfeil. It was introduced at very late stages of WW2 and didn’t manage to prove its full potential. However, we do know it was the fastest propeller-driven airplane in the entire war. 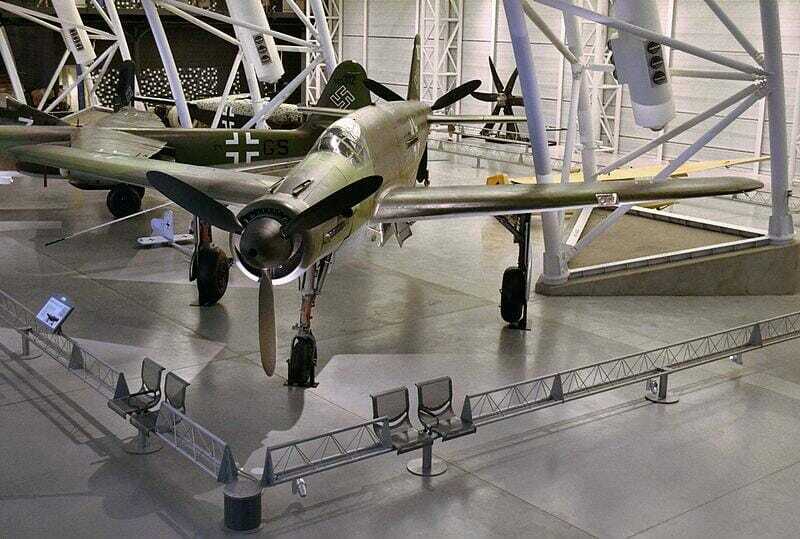 Dornier Do 335 Pfeil had two engines mounted in the fuselage and each one of them drove a separate propeller – one was pushing the airplane, while the other one was pulling. This peculiar arrangement meant that Do 335 Pfeil could reach speeds of up to 765 km/h and even if one of the engines was turned off or disabled it could still fly at 563 km/h. 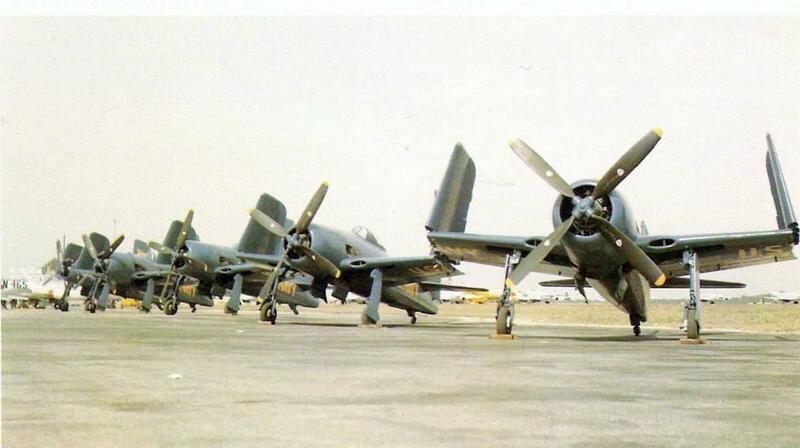 Only 11 fighter planes were delivered in 1945 until Americans took over the factory, but those Allied pilots who witnessed the Do 335 Pfeil could not believe its speed at level flight. Now the only surviving example is in a museum, so we will never know what speed could it reach in a dive. However, we do know that a British Supermarine Spitfire reached 1,110 km/h speed in a dive in 1952. That’s the closest propeller-driven airplane ever got to the speed of sound. That is an impressive performance, but it is far from the actual fastest plane in the world. That would be Lockheed SR-71 Blackbird, which in 1976 reached 3,530 km/h. This strategic reconnaissance aircraft is retired from 1988, but is still regarded as one of the best airplane designs ever.